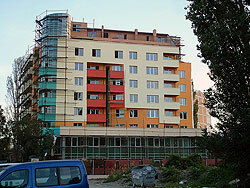 Poduyane, on the eastern outskirts of Sofia, is a residential area. Once merely a village, it became part of the city in 1895—the first village to do so. Its neighbourhoods include Suha Reka and Hadzhi Dimitar (both of which have apartment blocks and single-family homes), Levski-V and Levski-G (both of which only have apartment blocks), and Levski (houses only). The quarter is bordered by two rivers and the international railway that cuts across Sofia from northwest to southeast and separates Poduyane from the city centre.